Update: Unfortunately, we’ve had to cancel our kids’ party due to low ticket sales. Our adult party is definitely on, though, and we have some fun things planned! Our Harry Potter birthday party has become our most popular event of the year. For our fourth annual celebration, we have decided to split the party into two – one for adults and one for children. Both parties will have a Knockturn Alley theme this year. Our adult party will take place on Saturday, July 28th from 6-8PM in the French Quarter at Potions Bar, which is above Fritzel’s. We’ll have a scavenger hunt, dark arts, themed drinks, trivia, and prizes. There will be a cash bar. Plus, you’ll need a secret password to get into the party! There are 45 tickets available for this party. Get tickets here! Our children’s party will take place on Sunday, July 29th from 12-2PM at the bookstore. 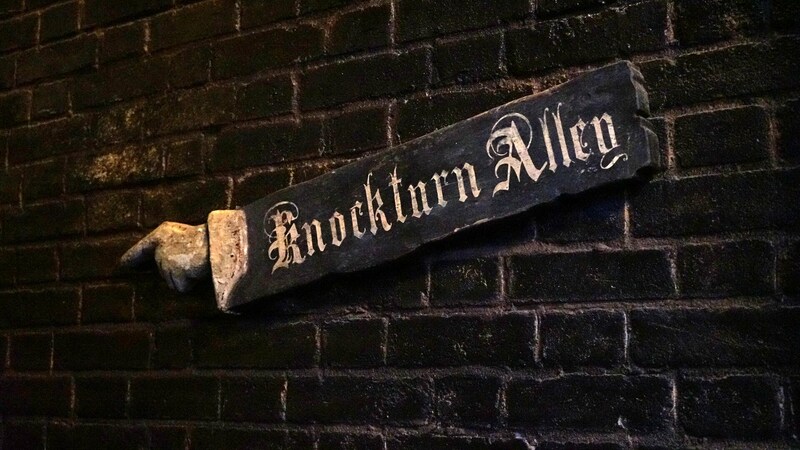 We’re turning the alley next to the store into Knockturn Alley for the party! We’ll have a scavenger hunt, dark arts, activities, and prizes. You’ll also need a secret password! There are 30 tickets available for this party. Tickets for both parties cost $20 per person. For the children’s/family party, kids under 4 get in free. Adults are more than welcome to attend the children’s/family party as well (even without kids!). We’re excited to do two parties this year and to have some fun with our customers. Hope to see you there!